Low profile design minimizes the difference in legheight to help maintain a normal walking gait and balance. Wide distance between the uprights accommodates extra dressings andswelling. Three leg straps and two foot straps are adjustable fordesired size and compression. Nonskid rocker bottom sole for safety,fits left or right leg. Shoe size: Men's 8-11, Women's 9-12. AllegroMedical.com presents The Standard Short Leg Walkers. Low profile design minimizes the difference in legheight to help maintain a normal walking gait and balance. Wide distance between the uprights accommodates extra dressings andswelling. 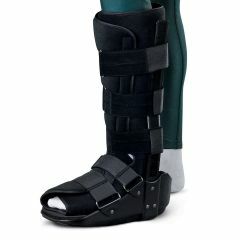 Three leg straps and two foot straps are adjustable fordesired size and compression. Nonskid rocker bottom sole for safety,fits left or right leg. Medium. Shoe size: Men's 8-11, Women's 9-12.